We’ve all heard the horror stories of teens and young adults traveling abroad. The headlines of Natalee Holloway and Amanda Knox, and Hollywood thrillers like Taken have scared us into thinking that what happened to those girls could happen to our children as well. While these awful events and the many other less publicized stories of youth injured, killed or arrested on trips should not cause us to fear traveling with our children or sending them off with adventure groups, they should give us pause to examine the safety of these trips and the qualifications of the hands we leave them in. My son Tyler Madoff died while on a Bold Earth teen tour in Hawaii during the summer of 2012. Andrew Mork, Bold Earth’s tour guide leader, and Nolan Reed, an employee of Hawaii Pack and Paddle (a subcontractor of Bold Earth) took 12 teenagers, including my son, to the edge of a cliff off the Kealakekua Bay, in the Captain Cook Memorial State Park. There they climbed into active, churning tide pools and were struck by forceful waves. Two of the boys, Matthew Alzate and my son, were swept out to sea. Matthew was rescued and revived, but my son was never found. The group was hiking off permit through the state park to the Pahoehoe Lava Flats, facing the ocean at the Napo’opo’o Lighthouse when they ventured without permission into these lava flat tide pools. Their license to operate tours was subsequently revoked by the local authorities. There were high surf warnings in effect, resulting in other tour companies pulling their groups at lunch time due to the unsafe conditions. The Bold Earth tour guides had no safety gear with them when they entered into the tide pools with the 12 teenagers; no ropes, no flares, no life jackets, no cell phones! A fisherman witnessing the commotion called 911 minutes after our son was swept out to sea, while Mork and Reed had no way to call for help. The surviving and obviously traumatized teenagers were not allowed to call their parents for hours; Abbott Wallis, owner of Bold Earth, was concerned that the tour would disband if the kids expressed that they wanted to go home. Much worse, Wallis waited 5 hours after my son was swept into the sea to call my wife and me to inform us that our son was missing and likely dead. We subsequently learned that he had made several calls to his attorneys, a public relations firm, and to the owner of Hawaii Pack and Paddle, Barry Mims, to “get on the same page with this” so as to avoid legal responsibility. Obviously, the first few hours of a search are the most crucial, but because he delayed calling us, we did not have the opportunity to hire local help to search for Tyler until the next morning. The morning after my son’s disappearance Wallis instructed Mork to continue the tour, taking the remaining teenagers ninety minutes up the coast the next day. No one from his company was in Kona to greet us or show us to the bay where our son died. When the tour moved on Mork simply left Tyler’s backpack with a local fisherman at the bay. A kind social worker met us and took us to the site and to the fire house to meet with the Coast Guard and Fire Department search and rescue personnel. Am I an angry, grieving and broken father who is resentful towards the Bold Earth and Hawaii Pack & Paddle personnel? Yes I am. But I am mostly writing this note in the hope that other families will not have to suffer as we do every day. The Madoff family reached a wrongful death settlement against Bold Earth Teen Adventure Tours and Hawaii Pack & Paddle in February, 2014, nearly two years after losing Tyler. In addition, they have launched an effort to educate other families on the risks of teen travel and encourage them to take every precaution to #MakeSafeTravelHappen. 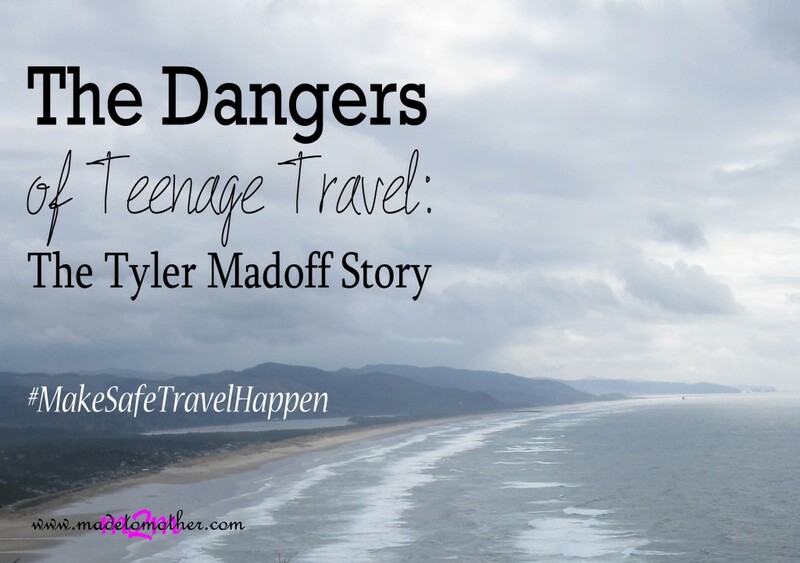 Michael and Marianne Madoff also hope that Tyler’s story will serve as an example for other tour companies to take better precautions and enforce safety programs so that no families need to suffer as the Madoffs have. They also plan to set up a fund to raise awareness and support search and rescue efforts in Hawaii. Investigate where they’re going, who they will be traveling with and every stop along the way. Get feedback and read reviews on the companies from websites like TripAdvisor and their social media sites. Check local travel advisories about the destination they are traveling to on government pages, and enroll them in the STEP program, a free traveler program provided by the State Department. Do your kids know what to do in an emergency? Safety training for water, wilderness, medical and even self-defense could make a huge difference in a scary situation. Before they leave, familiarize them with the laws and regulations as well as the culture differences of the area they will be in. Have a communication, financial and an emergency action plan in place, and have them memorize it. Keep a file containing a copy of all their travel documents, and get travel insurance. Even if insurance is included in their travel package, get another, separate plan of your own. Follow along with their communication, financial and emergency action plan so you know they are keeping to it. Finally, watch their social media posts and, if possible, their phone and credit card activity. That can often be the truest window into what is going on with them, normal or out of the ordinary. As parents, we’d like to hold tight to our babies forever, but as they grow up, we need to allow them to fly on their own. If you truly believe you have done everything to send them with a reputable company and they know how to handle themselves in any situation, then let them go, and trust they are in good hands. Statistically, incidents on these trips are very minimal, but the experiences they encounter, the culture they will learn and the independence they gain will change their lives forever, and help shape them into the well-rounded and responsible adults you hope they will become. I am at a loss of words about what happened to Tyler. I can only imagine how his parents feel, this is horrible. Thank you for sharing their story and also for offering the safe travel tips. I, too, am speechless and so very saddened. No parent should have to go through this. I am grateful that something good is coming from this death. I have a sister who has lived on Kauai since 1973. When we talk each weekend, she might share the conditions of the waves, thus not surfing that day. They have had friends who lost a son in the Na Pali Coastline area and his body never was found nor do they know what happened. He was backpacking alone. Safety is key and companies that put anyone at risk need to be accountable. You are a neighbor at Small Wonders. I pray for this #… to make a difference. I am at a loss for words as this is such a tragic story. I cannot imagine. I am grateful they are sharing their story in an effort to not only bring something good out of this tragedy, but also to help us all to be more informed. May God continue to bring comfort to their hearts. Thank you for sharing with us guides to safe travel for teen’s or anyone – – here at Tell me a Story. http://letmetelluastory.blogspot.com/ It certainly does pay to research and take charged up cell phones and to also keep in contact with those at home during the trip. We sent our children with a church group to Mexico, and they were safe, but came back with a new appreciation for home. G’day from Oz! I found your post via Katherine’s party and as the mother of two teens found this heart-breaking to read. My daughter is at college now and I worry about her all the time but know she would always make good decisions. I hope my son will be the same when he heads off to college in a few years too. Thanks for sharing this and spreading the word about travelling safely.